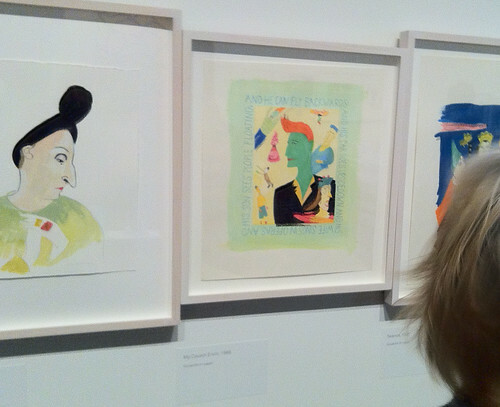 We'd been talking about seeing the Maira Kalman exhibit since last year sometime, when it was in Philadelphia but we never made it. We went on Saturday and we drove into town because our train was not running and we got a perfect parking spot. We walked a few pristine blocks, admiring the homes and listening to the quiet of a neighborhood we never visit. It was surreal and wonderful. 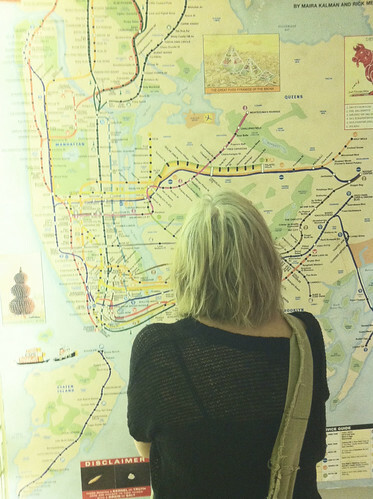 the back of my head and Ms. Kalman and Mr. Meyrowitz's subway food map. Both fascinating and wonderful. I'd encourage you to enlarge it and study it. Up a glass blocked stairwell we went. I can't even tell you how excited I was. 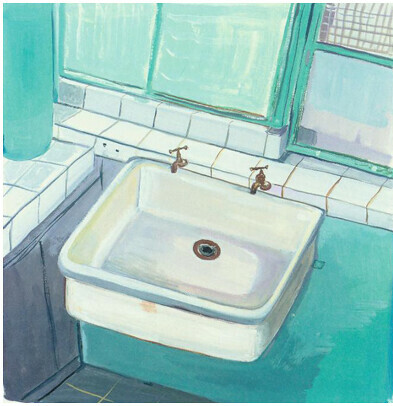 I have been, you see, an enormous fan of Ms. Kalman's work since...well, since Oldest was a baby, I think. I read him her books over and over again so, when I got to the top of the stairs I was fairly overwhelmed. We did sneak some pictures. like the endpapers of a book - but those were there too. A self-portrait to start things off. 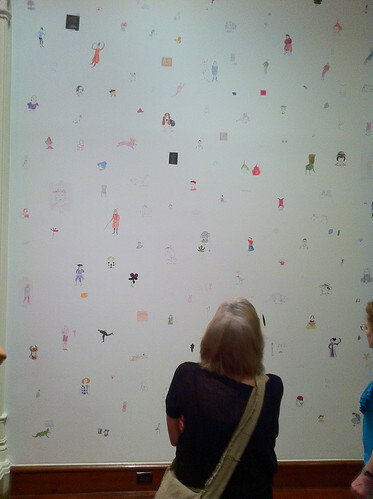 The viewer moves through the rooms in order - there is a progression to the pictures and objects. I could hear myself reading this page to tiny Oldest. Seeing this one, in particular, made me cry. There were some I had only seen in print. I loved them even more in real life. I cannot explain why her work resonates with me so significantly. I really can't. 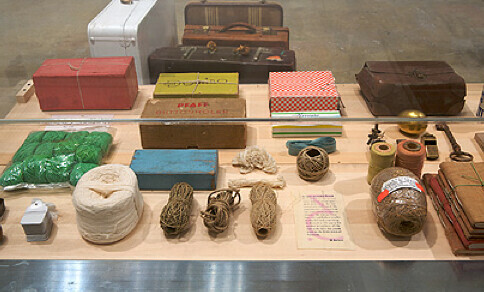 There were small collections of things that I, too, have a fondness for: buttons and tags and ladders and buckets. It was all very wonderful. I remembered, after I went home, how terribly sad I was on the first weekend of 2000. 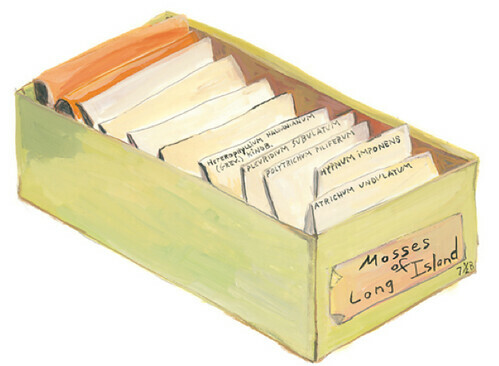 After reading for years about Maira Kalman and her family and their travels and projects, after marveling over stories about her children and admiring the work of her husband, I read this. Time has passed. I've met her and told her how much I admire her. I worked hard not to be creepy or gush, but the fact of the matter is, I am completely in love with her. Don't know her work but love the pictures. And your hair is beautiful. Thank you, thank you, for taking me there when I'm stuck on the other side of the country! 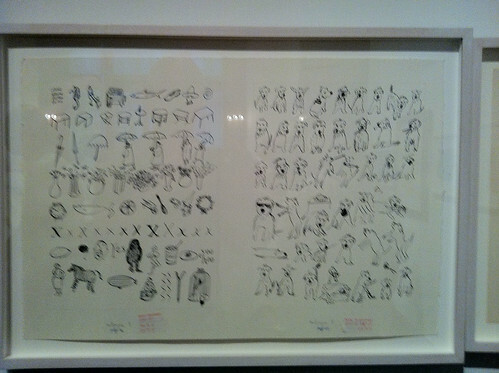 I have been a fan of Tibor Kalman's work since I first saw it some time in the 80's, and Maira of course has been an inspiration to me for years. ThankYOuThankYouThankYou for this. Will definitely overcome the mobility issue to make sure i see this. Love her. Great hair, by the way. And sent your brother good thoughts via twitter...hope i didn't scare him. 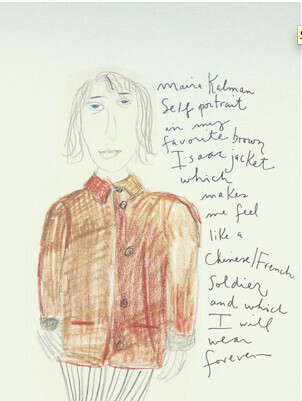 I came to the work of Maira Kalman late but it was you who pointed me towards her. I understand completely why her ability to capture the minutiae of a life lived would resonate with you because you share that gift. Thank you for showing this to all of us. I too adore her work, have admired her in the pages of the NYT and the New Yorker for many years. "The Pursuit of Happiness" was spectacular. I got shut down as I walked off the elevator and held my camera. Spyware? You are really one of the sweetest big hearted people I know. To share such a private love, something involving your first child ... it takes a huge heart to do that. I would normally be very protective and secretive about it. And BOY do you look HOT with your new hair! You hair is longer than I imagined.